There are a wide variety of vehicles available in the game, from Bart's quick little "Honor Roller" soapbox racer to Homer's slow but destructive "Mr. Plow" snowplow. Each car is controlled in the same basic way - you get gas, brake, and emergency brake buttons - but speed and handling will vary from vehicle to vehicle. Phone booths scattered around the city can be used to switch between any of the cars that you've unlocked and you can also hitch a ride from any vehicle that you pass on the streets. This allows you to pick the right car for the job before beginning a mission, or to replace a car that you've damaged to the point of destruction. Expect to total your share of cars as you'll face missions that require you to smash other vehicles or objects. You'll also be rewarded with coins when you smash streetlights, mailboxes, soda machines, and a myriad of other destructibles littering the streets of Springfield. The game is called Hit & Run after all. To keep you from creating too much carnage, Springfield's police will come after you if you max out your Hit & Run meter by hitting too many cars, obstacles, and pedestrians in a short period of time. "Smashy, smashy" will earn you a police chase and cost you fifty coins if you are caught. When you're on foot control feels more sluggish than when you are at the wheel of a vehicle. You are given a jump button, an attack button to break objects and destroy wasp cameras, and a sprint button that will allow you to run for short distances. Jumping and attacking do not feel as precise as they do in games that are primarily platformers, but the game is fairly forgiving and so you'll usually be able to jump your way to where you are trying to reach after a few tries. Getting out of your car will allow you to enter the interior locations in the game, which you'll need to do to meet characters and interact with some of the game's bonus objects. There's not much to the interactions - for example, you can hear "Frostilicous" say "is it the future yet?" - but they'll reward you with a coin and the game tracks how many of the interactive objects you've located in each level. Some coins in the game can only be reached on foot by jumping up to high and hidden locations, and it is in these areas that you'll sometimes find one of the seven collector cards hidden in each level. 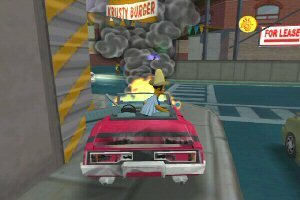 Coins are used to purchase vehicles for use in the game and to unlock different character costumes - the game certainly takes on an even more comic element when Homer runs down the streets of Springfield in a muumuu or in his underwear. Although it can be occasionally frustrating and the gameplay is derivative of GTA3, Hit & Run overall is a lot of fun to play. If you enjoy The Simpsons, then it is a veritable must buy. You'll be amazed at the game's developers' recreation of Springfield and appreciate their attention to detail in packing in so many references to episodes of the series. It may not be able to hold your interest as much once you've completed the game and explored all of the levels, but it's a heck of a ride until you get to that point. In The End, This Game Hath Been Rated: 85%. Finally, a Simpsons game that is fun to play. Woo-hoo!